We would like to thank The Reading Fairgrounds Racing Historical Society and members Mike Shaub, Ken Johnson, Alan Carter and many, many others have been very supportive of our efforts here in the Vault. We encourage the fans of the Vault, and of the Reading Fairgrounds to join their great organization and support their efforts. To add your Reading Fairgrounds Memories - Click Here or email us at 3wide@optonline.net and put "Reading Memories" in the Subject Line. As a fan of the racetrack I now live in Florida and go to Volusia Speedway Park. My grandson and I went to the World of Outlaws and who did we see - Buzzie Reutimann. As we were reminiscing about the Reading racetrack he said he loved the 3 min. clock. No matter who you were when the 3 mins. were up you did not get out of the pits. He still races the modifieds and gets a win now and then. Buzzie now lives in Zephyrhills,Fl and loves to talk about the good old days. I was a Reading race fan from 1972-1975. in 73 my brother and I did not miss a race. For $ 2.25 you could see some great dirt track racing. It was in this time that they went from running pre-war coupes & coaches to the Pintos and other more modern bodies. A lot of these races were won by #1 Tobias, # 76 Chamberlain, # 57 "Mr. Outside" Brightbill, # 5 "Mr. Carb” Bobby Gerhart, and my favorite # 26 Red Coffin. I remember on those dry summer Friday nights getting out to the parking lot to find our car coated in dust. Great drivers, great fans & great memories!!! 1966 while standing in front of the of the main gate to the race way, my life was changed for ever. I was 16 met and started talking to a beautiful 15 year old named Carol,to this day we're married 46 years. Lindy's FORMULA L and everything else bring back so many memories of my daddy & me going 2 the races!! Coming across this site has just made me smile "
Wow...I hadn't realized this the first several times that I viewed these photos, but that top photo was taken by Ronnie G and I'll bet that I was sitting right next to him (or his sister) when he took it.....I believe that it would have been down front where Gail Silver sat (The Taz Section). When i was about 12, my friends and I use to spend a lot of time just hanging around the reading fairgrounds even when there was nothing going on. I remember there was this little one room building somewhere between the old farmers market and the racetrack. The door was open ,and there was the #6 of Jackie Hamilton. He seemed to be always there by himself working on his car. And always remember him driving the #6 from his shop, up the midway, behind the grandstand to the pits in his tee-shirt. Really Cool Times!!!!!!!!! I was about 12 the first time my Dad took me to a Friday night show at the Reading Fairgrounds in 1968. I was hooked immediately, and begged rides from everyone I knew to get there every week until I could drive. So many great memories... from the beginning of the evening watching Lindy Vicari driving the grader preparing the track all the way through to staying in the pits till long after the race. Warren Ruffner's voice getting the crowd riled up, Rudy Gaenzel down on the track starting the race, the french fries, the guy who airbrushed my awesome Toby sweatshirt, even Sammy Green in the Men's room, all of it greatly missed. The accessibility and willingness of the drivers to sign autographs and answer questions will never be forgotten or matched for me. I used to bug Toby Tobias with engine and chassis questions every week, and he never failed to smile and answer my questions. No attitudes or egos; just guys doing what they loved and sharing it with those of us who wanted to be a part of it any way we could. 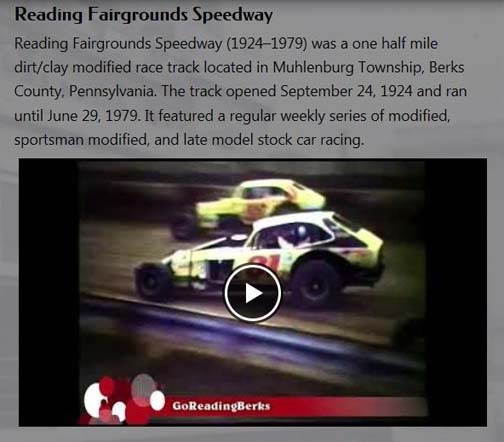 I still watch racing on TV every week, go to local short tracks, and enjoy the sport very much but my days at Reading from 1968 to 1976 will always be very special to me. Hi, my name is Roy and, when I was 14 I fell in love with stock car races at the reading fairgrounds. A friend on mine worked for Al Gaspari, just hanging posters and handing out pamphlets for the fair, and on race days we would hand out pamphlets at the gate, I fell in love with stock car racing, my favorite driver Al Tasnady, one day we had to go to Allentown and hang Reading fair posters on the way, we had no way to Allentown, this man was in the office, he said that he would take us, I didn't know him at the time but I soon found out the man Al Tasnady, it was the thrill of my life. I lived in reading, after that there was about 5 or 6 of us we would walk to the races every Friday and Sunday. I loved the french fries. I don't know if they smelled that way or if it was a mixture of the fries, dust, oil, but it was great. I have seen Toby Tobias and Tasnady fist fight in the pits, I seen a car flip up over the strings of red, yellow, and green lights strung accross the race track in front of the grandstand, I was at the races the night Jackie Evens crashed it was probably the worst night. The best night, for me anyways, Daniel Boone 200, my friend and I helped keep score. I would write down the first five cars on a paper and my friend would give to the score keeper, that was the best night. I joined the army in Jan. 77, The night before I had to leave for Germany, my wife and I went to the races. I came home in 1980, the first thing I wanted to do was go to the races. My wife got me in the car and we went to what I thought was the fairgrounds, and to my surprise, there was a mall in it's place. In my mind maybe the worst thing that could have happened to this area, I just have a lot of fond memories. 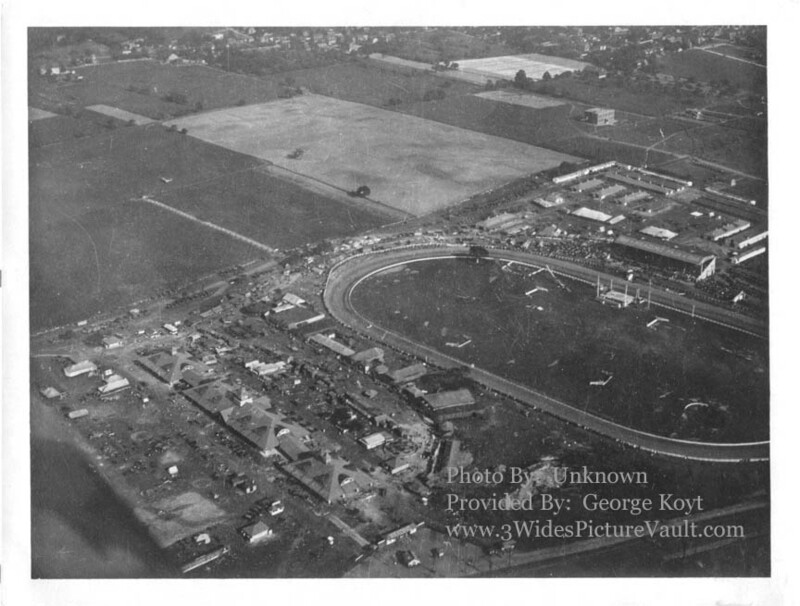 Being a regular at Nazareth Speedway the most exposure I had to the Reading Fairgrounds was in the AARN weekly and the monthly pictorials, several of which I still have. Well, one day my dad decided we were going to the races at Reading. With all the great racing I saw at Nazareth over the years, this one particular visit to Reading provided me with the closest, most exciting race I had ever seen. I had heard tales of the packed houses Reading got, and this night was no disappointment. We settled into our seats under the big roof and got through the heats and consolations. During intermission we went down for some of those famous french fries to the right of the main stands, then got back to our seats for the main event. The feature event started and the crowd was starting to build into a frenzy already. Im not sure of the year, but the big rivalry on track was Chamberlain in the #76 Mustang (was it) and Brightbill in his famous #19 Pinto. As the feature went on, both of them were working their way toward the front. The caution flew with about 10-11 laps to go, and those two made up the front row on the restart. By this time, the crowd was really wound up and getting louder. On the green, they took off from the rest of the field. Brightbill running the high line and Chamberlain hugging the fence on the inside. Lap after lap, side by side, neither one could get the advantage on the other. The crowd was standing now, no one was in their sits as we all were yelling for one or the other. One lap Kenny led, the next Gerald was in front. It went like this lap after lap after lap. The white flag was waving and they were still side by side, as the crowd was so loud you hear them all the way up in Allentown. Through turns 1-2 they were still neck and neck. Down the backstetch it was still a dead heat as they enter turn 3-4. Neck and neck through the turns, Brightbill high, Chamberlain low, coming off the 4th turn its now a drag race to the start/finish line. Brightbill, Chamberlain, Brightbill, Chamberlain as they near the checkered flag. The flag waves as they near the finish and at the line it was...............................................Kenny Brightbill by a coat of paint on his bumper. The crowd went crazy as they had just witnessed what dirt track racing and the Reading Fairgrounds were all about. This is what the Reading legends were made of. Long live the memories!!!! My name is Fred George. I now live in Macungie, PA and I dearly miss the tracks that are now gone. I was a regular at Reading from 1970-79. Even when I was in college I worked part time so I could attend Reading. Always sat in the small bleachers off of turn four except for the Daniel Boone 200, than I spend the extra money and sat under the covered grandstand. Saw my first USAC and sprint car race there. My favorite driver was Toby Tobias. I use to park under a big oak tree directly behind the bleachers I sat in and watched the cars being towed in and checking in at the pit gate. I was pretty cool seeing the cars on the open trailers and some guys, Chamberlain and the State Wide Team, etc. brought two cars, one on a flat bed truck the was specifically built for a racecar and that truck would pull a trailer with another car on it. They can take a lot of things away from you but they can't take the memories from Reading. 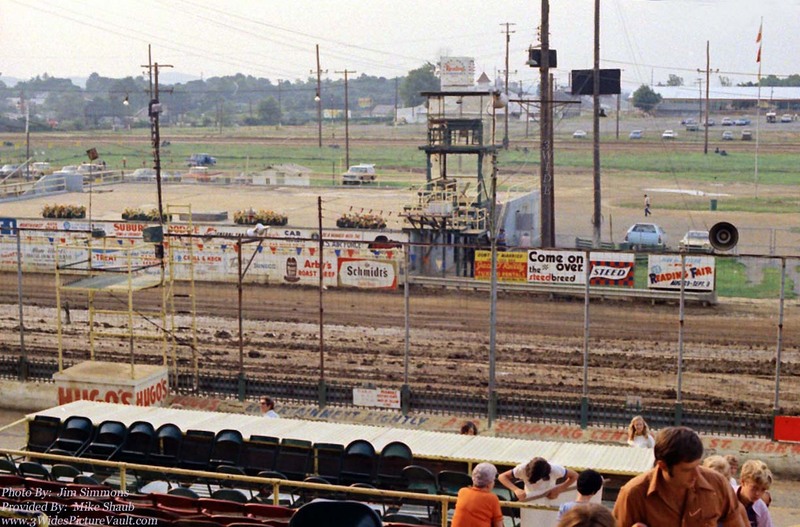 Reading was the first track that I visited to see the USAC sprint cars run - actually, it was one of the first races I ever attended. It was there we met Parnelli Jones and Joe Pittman. One story I do remember well, was the fact that I had to sit in the grandstand. Women were not allowed in the USAC pits at that time. Sitting next to me was a young lad, approx. 8 yrs. old who had many questions for his Dad. Could not help overhearing him, did not interrupt until the Fike sprinter fired up and the sound was music to my ears. The lad mentioned this to his Dad who ignored the question so I told him that it was a small block Chevy in there - not an Offy like the others ran. Golly, did Dad wake up then - told the kid that the lady did not know what she was talking about. I got the "last laugh" when the announcer mentioned the sound and that it was a Chevy engine in there. The lad laughed and said to me - "you knew what motor it was". Got Dad more angry when I told him that we call them engines. Tried to explain the difference but gave up when Dad told the lad to go get something to eat. Wish I would have had eyes in the back of my head when Joe Pittman, the father and chief mechanic on the race car, came to the fence and motioned for me to bring him the qualifying lap times. Dad did not talk to me the rest of the race and certainly, did not root for Parnelli. BUT, I did, loud and clear. Hope you enjoy my "way back when" little tid-bits. Have had 2 men email regarding the Bobby Marshman story you posted on Hatfield Memories, and I thank you. Love to hear from people who remember the "old times". Am now a Tony Raines, GramaFan, not related but his methodical way of moving thru the pack and his quiet demeanor make him a favorite. Was led onto his career from some other "old time" USAC friends and fellow co-workers there. Keep up the good job with these memory pages. Thanks again, Peggy Snyder at plsnyder@ptd.net - welcome all emails and/or questions and stories. 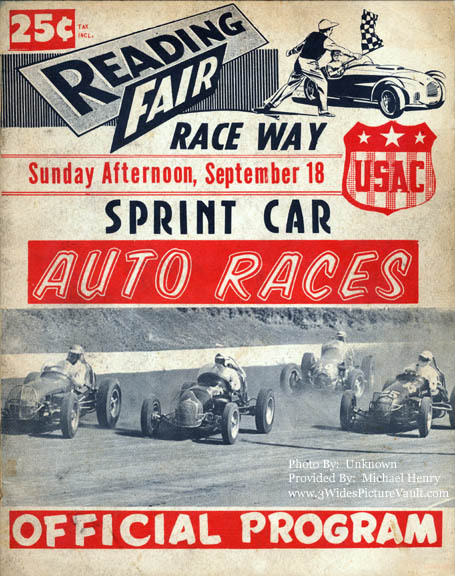 I missed the first race at Reading in 1955 when the RSCA first held flathead races and then hadn't missed a race until I went into the service in Aug of 1969. Reading ran about everything you could imagine; AAA/USAC Sprints, Flatheads, which included powderpuff derbies, mechanic races and officials races, Sports cars (SCODA), Motorcycles (AMA), Go-Karts, USAC/ARDC Midgets (one being nationally televised on NBC), NASCAR Grand Nationals with Lee Petty, Cale Yarborough and other great drivers, NASCAR Drag races (on the 1/16 drag strip being the front stretch which featured Don Garlits, "TV" Tommy Ivo and Kris Karamacines, not quite sure of the spelling), Sulky races, Greyhound races, Demolition Derbies, Sportsmen, Street Stocks, Winged sprints, a scheduled snow mobile race (no snow-no race) and of course the Modifieds. Almost all the top drivers in each division raced at Reading at one time. I believe Reading was the only track around that ran one division up until the later years. They always averaged 8-9 thousand fans even for the flatheads. Fans would arrive early just to cheer or boo the cars as they would cross the track in turn 4. Warren Ruffner would get the fans going with "Who has the hot shoe tonight!!" and then name the different drivers. And now like so many tracks, it's just a memory. 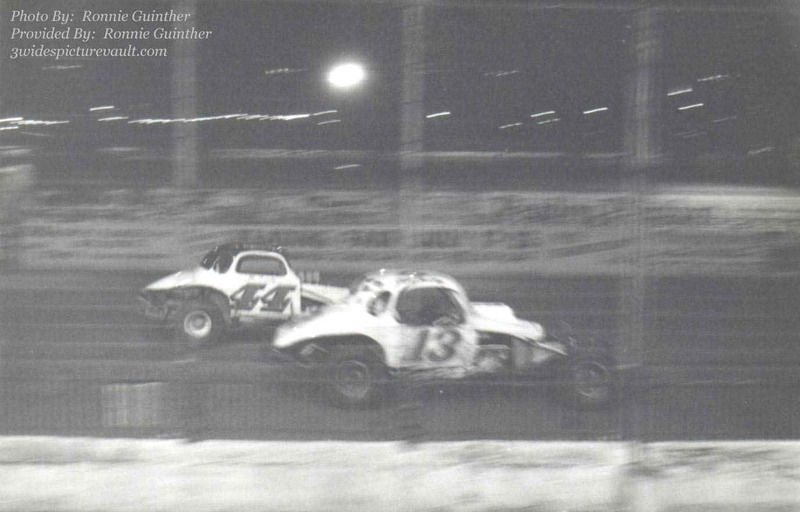 Thanks to 3wide, with their great photo display of cars/drivers from the past, there are still those who remember what it was like to go to a race with REAL race cars and drivers that had their own personalities. If I had a dollar for every time I heard someone say that they should tear down the Fairgrounds Mall and build another track, I could've almost bought the mall and built a new track.